Published: March 18, 2019 at 06:15 p.m. Updated: April 2, 2019 at 01:13 p.m. The frenzy that is the NFL's free agency period hasn't disappointed, as several fantasy stars have changed teams, been traded or even released. Here's your first look at the winners and losers so you can start prepping for your 2019 drafts (never too soon)! Bell doesn't have the protection in New York that he once had in Pittsburgh, but he's going to remain a volume beast who should no doubt see 350-plus touches for the Jets. 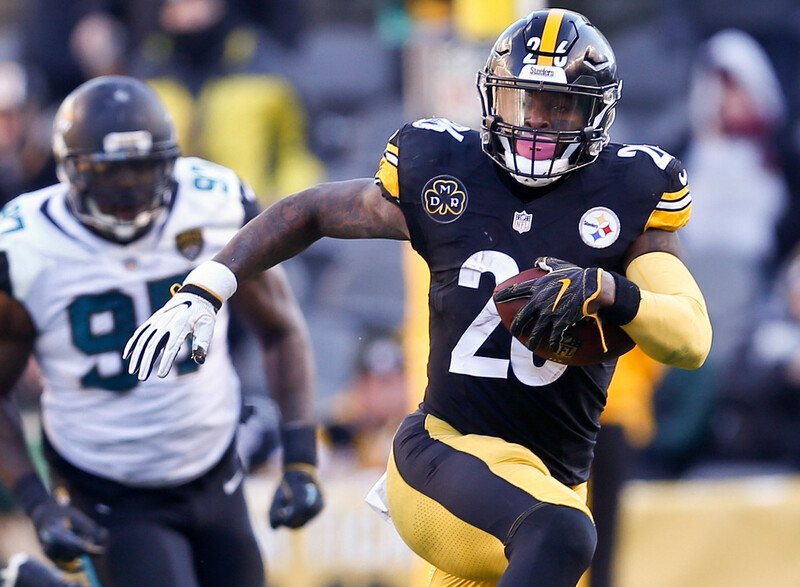 One of the most talented and versatile backs in the league, Bell will remain a first-round pick in all 2019 fantasy drafts. OBJ is a push because he didn't gain or lose value as a result of his trade to the Browns ... he'll remain one of the first five wideouts taken in all drafts. If anything, he'll see a slight uptick in his appeal as a result of an upgrade at quarterback from Eli Manning to Baker Mayfield. Brown is still a No. 1 fantasy wideout, but he loses some luster in Oakland. He goes from an offense that led the NFL in pass attempts last season to one that tied for 16th, and Derek Carr has never been above average in yards per pass attempt. AB will also see some touchdown regression. Ingram lands in a great spot to reclaim his status as a valuable asset in fantasy leagues. The Ravens ran the ball almost 64 percent of the time last season with Lamar Jackson under center, and Ingram has the tools to be a three-down back. The veteran is once again an attractive No. 2 runner. Howard's trade to the Eagles makes him a winner, as he'll now be the favorite to start and see early-down work for coach Doug Pederson. While he isn't going to give fantasy owners much in the way of catches, Howard, 24, has rushed for the third-most yards among running backs since 2016. The good news is that Coleman is reunited with head coach Kyle Shanahan, who helped him produce his best fantasy season during their time together in Atlanta. Coleman is also the Niners back to own, but a confusing committee situation with Jerick McKinnon and Matt Breida is possible. Tate was basically useless from fantasy perspective as a member of the Eagles, so a move to the Giants will help his value ... especially with OBJ no longer in the mix. In fact, Tate could end up leading all Giants wideouts in targets in an offense that will throw lots of short stuff next season. Cook is coming off the best fantasy season of his career, finishing fourth in yards and fifth in PPR points among tight ends. I'm not sure he'll be a top-five player again in 2019, but landing in New Orleans with Drew Brees gives him a fighting chance. He'll remain a No. 1 option. Hunt has been suspended for the first eight games of the 2019 season, which is enough to make him a fantasy loser. He's also going to be stuck in a potential committee with Nick Chubb upon his return, which is a far cry from the featured role he thrived in during his time in Kansas City. Murray will replace Ingram on the Saints depth chart, but I don't think he can replace the level of production Ingram found in New Orleans. In fact, Murray is probably better off seen as a high-end handcuff for owners who draft Alvin Kamara. So, his role won't change all that much in 2019. Davis is a big winner in fantasy land, especially now that the Bears have traded Jordan Howard to the Eagles. Now the favorite for early-down and goal-line duties, Davis could push for flex-starter value as the second option in the Chicago backfield behind the versatile Tarik Cohen. Crowell is the favorite to start for the Raiders at this point, making the veteran back at least a slight winner from a fantasy perspective. He did average a solid 4.79 yards per rush for the Jets a season ago (though he had 219 yards in one game), so consider him a viable RB4/RB5 in 2019. Humphries is coming off a breakout season in Tampa Bay, which turned into a four-year, $36 million deal with the Titans. The veteran had a 70-plus percent catch rate over his last two seasons with the Bucs and will "slot" right into Tennessee's pass attack. He'll be a WR4/5 in 2019 drafts. Who says you can't go home again? Jackson was traded back to his original team, the Eagles, where he will become the home-run hitter and lid lifter in the pass attack for Carson Wentz. While he's not going to return consistent numbers, D-Jax does see a slight boost in his overall value. Brown was a strong fantasy option in the first half of last season, but he faded once the Ravens went to Lamar Jackson. He's a nice fit for the Bills and big-armed quarterback Josh Allen, as Brown has averaged 15-yards-per-catch in his career and should make some big plays in Buffalo. Crowder landed in a good spot with the Jets, who will make him their primary slot receiver right out of the gate. Sam Darnold was eighth among starting quarterbacks in pass attempts per game to slot receivers in 2018, so Crowder should see plenty of opportunities. He's a late-rounder. Funchess is coming off a down season with the Panthers, but he's still just 24 years old and could turn into a nice bargain for the Colts. A 6-foot-4 and 225, the Michigan product should develop into a nice red-zone target for Andrew Luck. Look for Funchess to come off the board late. Williams is a winner in that he lands on a Raiders team that will give him a starting role opposite Antonio Brown, so he should have his share of good stat lines. He likely won't be the most reliable fantasy wideout, however, so Williams might be better served as a best-ball option. Hyde lands in a running-back friendly offense under coach Andy Reid, which is obviously a good thing for our purposes. I still project Damien Williams to the main runner in this backfield, though, so Hyde won't come off the board until the later rounds of most 2019 fantasy drafts. Here's the good news ... Cobb is on a one-year prove it deal and should see more than his share of the targets left behind by Cole Beasley in the slot. The bad news is that he's not durable and won't be catching passes from Aaron Rodgers anymore. I'd consider Cobb worth a late rounder. Moncrief hasn't been durable during his NFL career, but he couldn't have landed in a better spot to resurrect his value in the world of fantasy football. With AB now in Oakland, Moncrief should start for the Steelers right out of the gate. He'll be well worth a late-round choice. Amendola won't produce the same sort of numbers as Golden Tate did in Detroit, but he should see opportunities in the middle of the field for the Lions. That makes him a fantasy winner, albeit not an exciting one. He'll be worth a late-rounder flier in deeper PPR leagues. Foles is back in a starting role, which makes him an obvious winner in terms of his fantasy appeal. Of course, he's not going to put up monster numbers in the Jags' run-based offense. The bigger winners here would be the his wideouts and running back Leonard Fournette. The ageless Gore is entering his age-36 season (will he play until he's 40? ), but he did average a solid 4.6 yards per carry for the Dolphins a season ago. He'll be second in line for touches in the Buffalo backfield behind fellow veteran LeSean McCoy, but he's just a late rounder. Anderson was a star at the end of last season, but how many touches would he have seen behind Todd Gurley (assuming he's 100 percent) in 2019? Now in Detroit, he'll be second for backfield touches behind Kerryon Johnson in the "LeGarrette Blount" role. He'll have late-round value. Death, taxes and Fitzpatrick will make NFL starts. Those three things are guaranteed every year. I don't think he's worth a re-draft pick, but Fitzmagic could be a matchup-based option. There's a good chance he'll be throwing the ball a lot late in games next season. James was useful at times for fantasy fans in Pittsburgh, and now he'll slide into a starting role ahead of Michael Roberts in Detroit. That makes him a winner for our purposes, though he's mostly a blocker and still not draftable in most fantasy football leagues for next season. Keenum doesn't have a whole lot of reliable weapons in the Redskins passing game, making him worth no more than a late-rounder in two-quarterback leagues. He's mostly off the fantasy football radar for a team that's going to be running the football a ton next season. Flacco has rarely been a reliable fantasy option, and that won't change in Denver. While he does have some young talent at wide receiver, the veteran isn't a great re-draft option (as is usual). In fact, his stock is likely limited to two-quarterback fantasy leagues moving forward. Beasley joins a crowded corps of wide receivers in Buffalo with John Brown, Robert Foster and Zay Jones in the mix, and his skill set doesn't fit the big arm of Josh Allen. He'll be forgotten in most re-drafts, even in PPR leagues, in 2019. Brown is the better bet for fantasy owners. A kicker? Yes, a kicker. Myers was a Pro Bowler a season ago, making 33-of-36 field goals while also finishing fourth in fantasy points at the position with the Jets. While he could struggle to reach that high level once again, Myers will be a viable No. 1 kicker in the Great Northwest. Patterson was somewhat useful at time for fantasy owners last season when he was getting some burn out of the Patriots backfield, but that won't be the case in 2019. In fact, he's likely to be used more often as a return man on special teams. Patterson won't have any re-draft value. Perriman landed in a good spot, as he'll compete to be the No. 3 wideout in Tampa Bay behind Mike Evans and Chris Godwin. He's been mostly a bust at the NFL level, however, as Perriman has put up just 916 career yards in his first three NFL seasons. He won't have any re-draft value. Swaim is a winner for now, as the Jaguars have him penciled into the top spot on their team's depth chart. That might not be the case after the NFL draft, however, as the team could look to add an impact maker at the position. Regardless, Swaim is unlikely to make a fantasy impact.